You don’t have to be a competition winner, or even a co-winner, to play a finger-busting showpiece like Brahms’ Second Piano Concerto. But it sure doesn’t hurt. 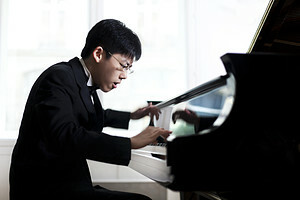 Haochen Zhang, the young Chinese virtuoso who shared the gold medal at the 2009 Van Cliburn Competition, turned up at the Lesher Center for the Arts in Walnut Creek on Sunday, May 6, to help Music Director Donato Cabrera and the California Symphony wind up their concert season together. It was the perfect way to go out for the year — with a sleek and muscular account of a piece that has the potential to devolve all too easily into slam-bang bluster. And to be perfectly candid, there was at least one member of the audience who was bracing for just that eventuality. A resume that includes a high-profile win at a piano competition can often signal a certain brand of unmodulated athleticism, one that favors bluntness and vigor at the expense of thoughtful eloquence. Zhang, at least on the evidence of his Brahms, isn’t that sort of pianist. Unsurprisingly, he has keyboard technique for days, and he’s not hesitant about unleashing pyrotechnics when the music requires it. The furious passagework in the concerto’s first movement emerged in all its densely packed glory, and the scherzo-like second movement wanted nothing in the way of heavyweight fervor. But Zhang also brought a steely transparency to the performance that allowed the intricacy of Brahms’ writing to register with striking immediacy. The effect was like observing a commercial building near the final stages of construction — you can see enough of the framework to appreciate how sturdy it is, and also enough of the surface detail to appreciate the full impact of the complete product. That meant shaping the concerto’s sometimes torrential flow with a sure hand, and crafting individual moments with well-defined clarity; Zhang’s trills, in particular, are clean enough to eat off of. But it also meant bringing a full-throated rhapsodic vein to the expressive slow movement, with help from the sumptuous solo playing of principal cellist Leighton Fong. Where Zhang did show a competitor’s streak was on the occasions where he suddenly decided to kick free of the orchestra and suddenly bump up the tempo without giving anyone prior notice. The result was a little startling, but Cabrera adapted suavely and there was no lasting harm done. Starting the program was the world premiere of “Like a Broken Clock,” a charming 10-minute curtain-raiser by Katherine Balch, who is beginning a three-year term as the orchestra’s composer-in-residence. There are more substantive offerings still to come from her — the 2018-19 season concludes with a new violin concerto — but for now this character piece was more than enough to whet a listener’s appetite. The title sums the piece up nicely — it’s a landscape of off-kilter ticks and tocks that dance their way nimbly through the orchestra. Most of the tick-tock comes from the string players, who tap the bodies of their instruments with their fingers, pluck the strings or let the wood of their bows bounce percussively off the strings. The woodwinds and brass, meanwhile, provide sustained whooshes of harmony without which the piece would be too dry and desiccated to appreciate. And then things flip around, as things tend to do. The woodwinds start exploring the idea of disconnected little notes, the strings take over the harmonies, and everyone joins hands in a vivacious climax. This is vividly imagined music, and Cabrera and the orchestra gave it a terse, evocative reading. A little of that crispness would have benefited Sibelius’ Third Symphony, which got a buoyant but sometimes blurry performance at the heart of the concert. This is one of the composer’s coolest and most poker-faced creations, and on Sunday it sounded perhaps a little puppyish and eager to please. Still, there was no arguing with the tuneful exuberance of the first movement, or the sure-footed pacing with which Cabrera drove the symphony toward its blazing final pages.